Our night at TRU did not start off well. We arrived promptly for a 10:15 seating yet did not actually sit until 10:40. Upon entering, my dining companion was offered a jacket (I was already wearing one). TRU is only one of two restaurants that I've been to with such a strict jacket policy, and I can say without hesitation that it was justified, for the level of service here was above anything that I've experienced before. During our wait, we were placed in a sort of lounge area, clad in a minimalist style with rather abstract wall decorations, including a CD player I confused for a light fixture (the $4000 Bang & Olufsen BeoSound 9000 if I'm not mistaken). We were offered a short list of drinks. I had a locally-brewed beer, which I found quite palatable, while my companion had a glass of sake (extremely smooth, excellent, and the most expensive on the list, as recommended by our server). After a fair bit of waiting, we were shown our tables in the main dining room. Upon entering the room, I instantly felt a sense of grandeur and splendor. This is where power and dining converge; this is where Chicago's elite and influential dine, a room packed will smartly-suited men and designer-dressed women, awash in a monotone din interjected by clangs of sterling silverware (and Laguiole knives) and clinks of Riedel crystal. The photo below was taken when we left (they were the last table) and does absolutely no justice to the atmosphere of the place. Now the service, oh the service! The level here was just a cut above anything else I've experienced. Napkin presentation, crumb removal, water refill, everything was over-the-top. Perhaps the most striking thing was the staff's utter synchronization. Plate removal and placement of silverware were all synchronized. And even for a table of six (as in the photo above), three servers cleared plates odd-even style in perfect harmonization. But perhaps the service was a bit too perfect, for my companion felt like "Alexander the Great if he were to come to modern times." The only peccadillo was when I requested a bottle of their house-bottled water, in a distinctive TRU vessel, to take home. I was not allowed to procure a bottle even after I had offered to pay for it, the excuse being that the bottles were in short supply. Sort of a pre-amuse course, served in a double shot glass, and eaten with a spoon. Unfortunately, we received it before I had permission to take notes, so I really don't have much of a description. However, there was nothing particularly memorable about it. 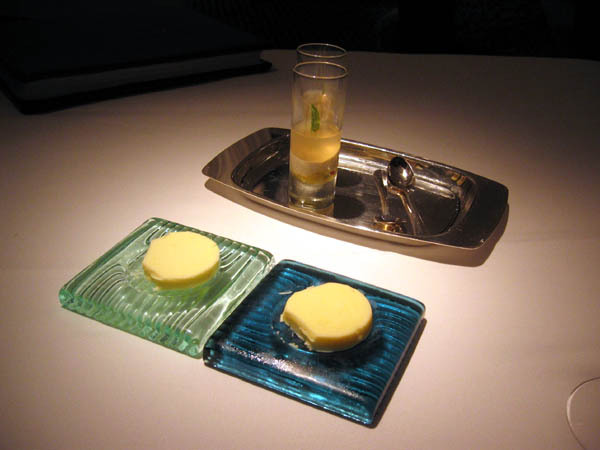 In the foreground are unsalted and salted butters (in the darker holder); the butter was initially a bit firm, but soon softened to the perfect consistency. Breads included pumpernickel, biscuits, and sourdough. 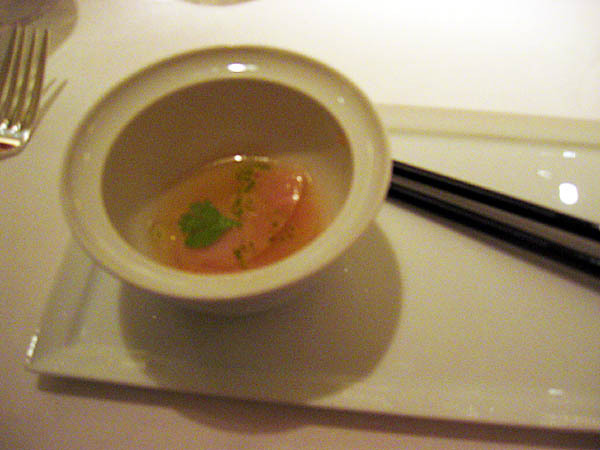 The actual amuse-bouche was a serving of sushi-grade hamachi in a tomato-infused water. The fish was indeed tasty enough; however I felt the flavors were quite typical, something I could get at any high-end sushi restaurant in Los Angeles, such as Katsu-ya or Nobu. Now finally, the real first course. The scallop here was as fresh as I've had at any sushi joint. But the real star was the caviar, quite possible the best I've ever had. The tangy saltiness of the roe played excellently with the utter rich creaminess of the raw scallop. Our wine here had a fragrant nose that belied its sharp, dry taste. 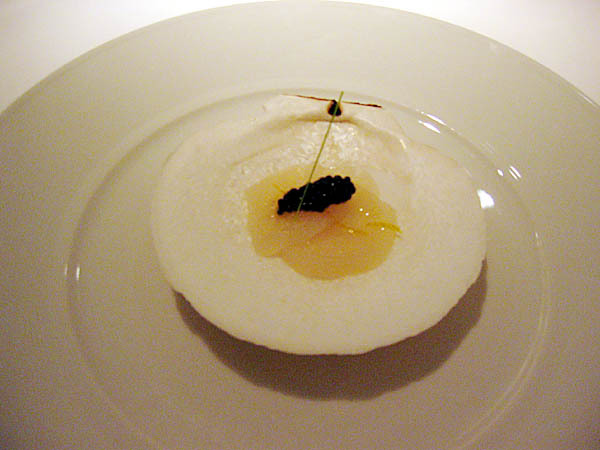 The Pinot Bianco provided a nice foil for the briny flavor of the scallop/caviar combination. At the end of the course I asked to keep the shell, which arrived well-boxed and in a fine-looking TRU bag. A nice touch indeed! It was at this point where my and my dining companion's meals diverged. We ordered the Chef's Market menu, and sure enough, Chef Tramonto took great advantage of that and served up two completely different series of dishes. I was rather impressed. If we had a table or four, would we get four different dishes each course? I wonder. The dishes I ate are marked with a "*". In any case, I had perfectly cooked morsels of chilled lobster, fresh, flavorful, with just the right texture. Unfortunately, the tomato syrup was a bit too intense, and tended to overpower the subtle flavors of the noble crustacean. This tanginess went quite well with the paired Riesling, which to me had a intoxicating apple-floral bouquet. 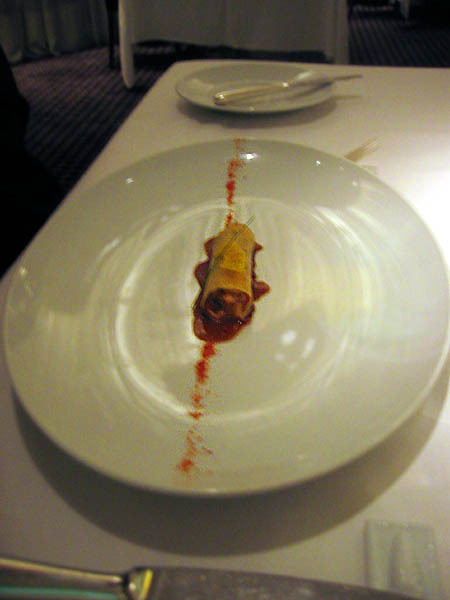 The other dish was a lobster crêpe, which I likened to a cannoli. The sauce was described to me as a tangier or "steroided up" version of soy sauce. Or to summarize: "What it lacks in size, it makes up for in taste." 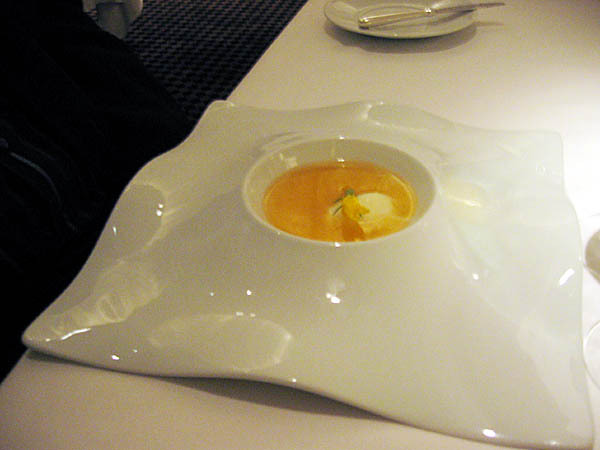 The soup course. And what a soup! The gazpacho had a unique kick, something that I really cannot put into words, except to say that it was superb. It gave me a slight tingling sensation in the mouth, a bit painful actually! I was not a fan of the wine pairing, a Sherry; but the gazpacho did take a bit of the bite out of it. Definitely the most unique soup I've ever tasted. Similarly, my friend also had a gazpacho and also experienced a slight sensation in the mouth, but in that case the tingling turned "very spicy" near the end. 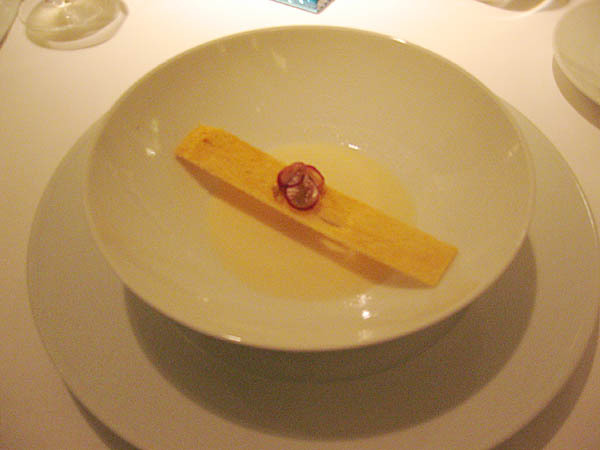 The next course was foie gras. 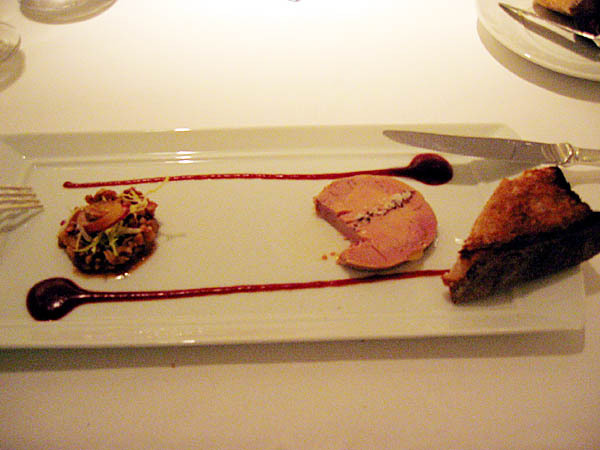 I had it prepared in a rich, creamy, luxurious torchon style with hazelnut compote and French country toast. I'm not a huge foie fan but I must say that this was the second best preparation I've ever had (the first was at Michel Richard's Citronelle in DC), perhaps since the flavor was a bit more subdued than I'm used to. The toast paired excellently as well. 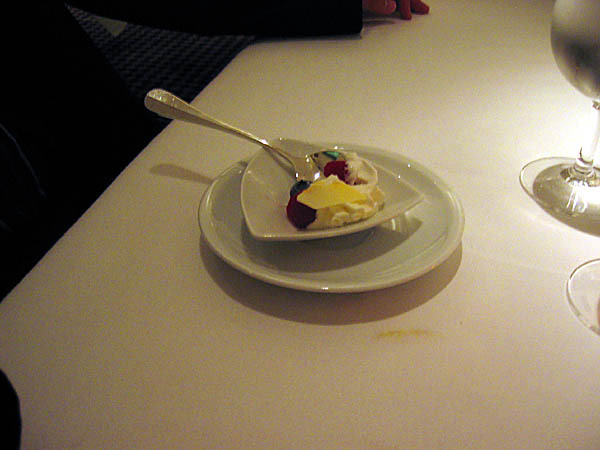 The other dish actually had two preparations: panna cota and seared. 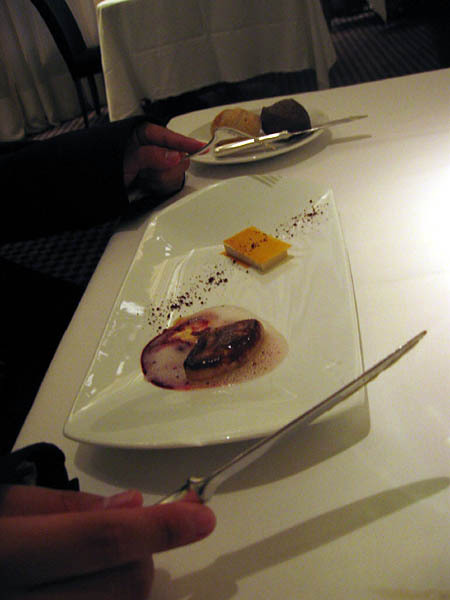 Not much to say except that it was my companion's first experience with foie gras, and probably the last. An interesting note is that Chicago has since banned foie gras. In fact, our server informed us that we'd just missed the deadline by three days. So in a sense it was quite nice to have foie in Chicago before this noble ingredient was lost to the city forever. Onward, to the fish course. 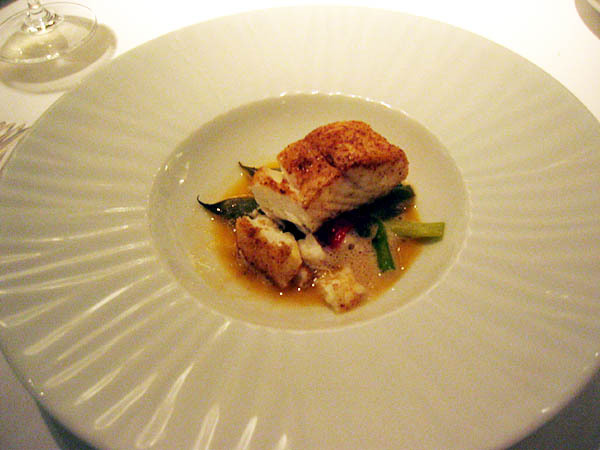 I had a roasted spice-rubbed halibut, and I must say that it was one of the best preparations of cooked fish I've ever had (and I'm usually not a fan of cooked fish, preferring it seared or sashimi-style), with the texture, taste, and vegetable pairing all coming together effortlessly and harmoniously. Our wine pairing had an almost "meaty" aroma with fruity overtones, a bit "rubbery" if that makes sense. 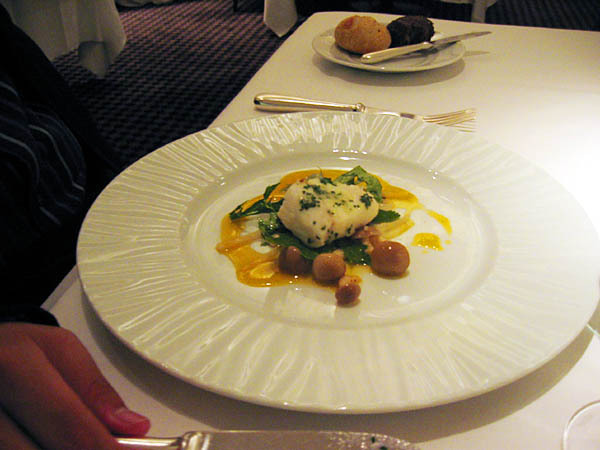 For the other presentation of halibut, my friend described the halibut itself as "typical" but that the rest of the dish takes the fish to "new heights." Two preparations of squab followed. Mine was a roasted bird with strawberry essence and squab jus. 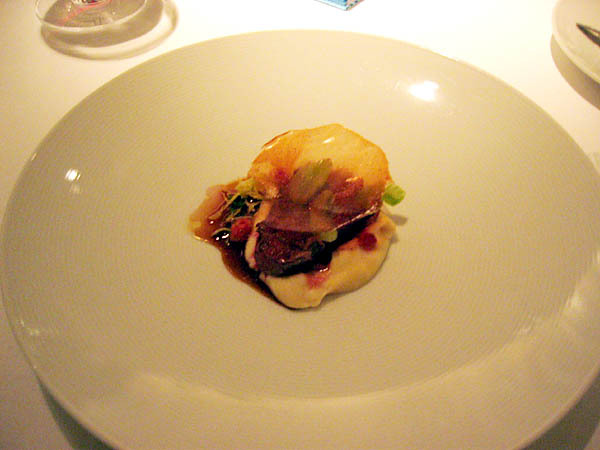 The tender sweetness of the strawberry provided a good foil for the savory flavor of the squab. I thought the meat here was at least as good as the bird I enjoyed at Alinea, though it lacked the former's sublime skin. As for the wine pairing, I found the Chinon to be a bit lean, a bit mineral-y for the bird. My companion had a chili/mocha squab breast, with almonds, peanuts, cumin, and cinnamon. 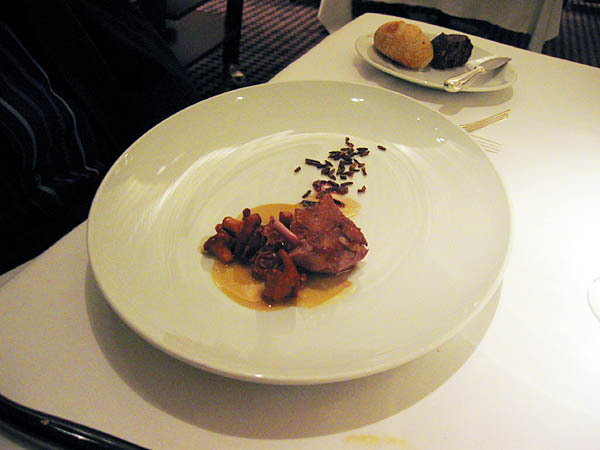 The meat was described as "excellent" as was the skin, with the chanterelles providing a exquisite complement. The puffed rice, however, was rather bland and was a bit of a disappointment. 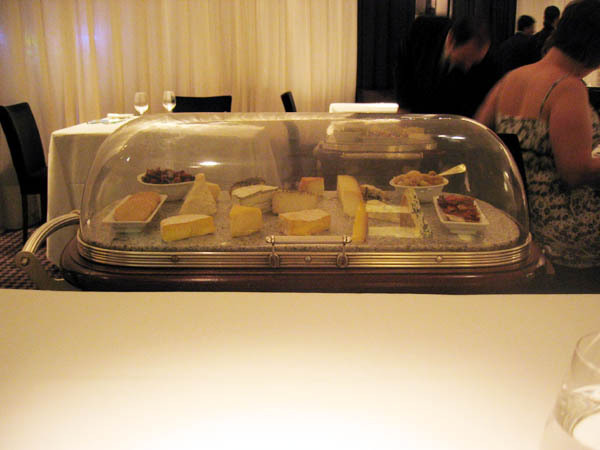 With the main portion of our meal completed, we were presented with the cheese cart. This surpassed Washington DC's CityZen (headed by French Laundry expat Eric Ziebold) as my favorite presentation of cheese. 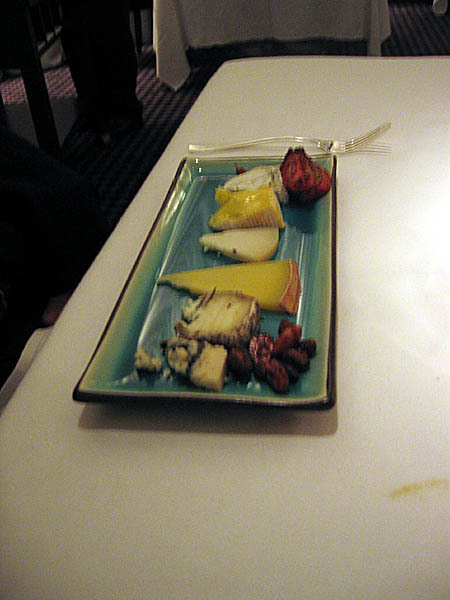 The cart was arranged front to back with cow's, goat's, and sheep's milk cheese; going left to right went from mild to intense. 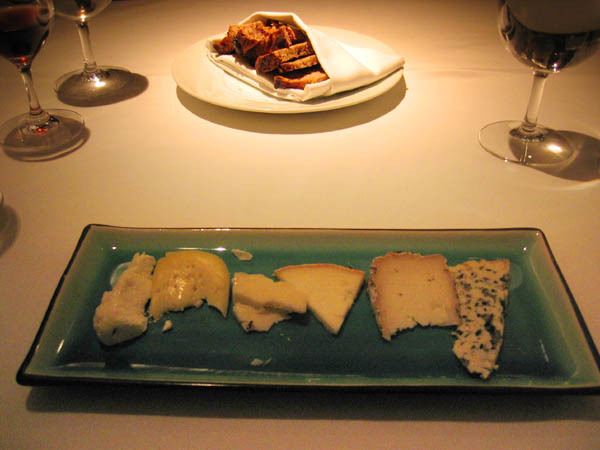 There were about fifteen cheeses in total; I was able to select six of them upon our server's recommendation, two from each animal, with a wide range of intensities. Unfortunately I cannot recall the names of the cheese I had that night. We were also given the choice of the usual accoutrements, crackers, nuts, fruit, etc., which I declined. As for wine, we were asked if we preferred a sweeter or a drier wine, I went with the drier Syrah while my companion went with a Port. Both paired well. A dessert amuse, in fact my first experience with such a course. Tasty, but nothing special really, basically berries and cream. 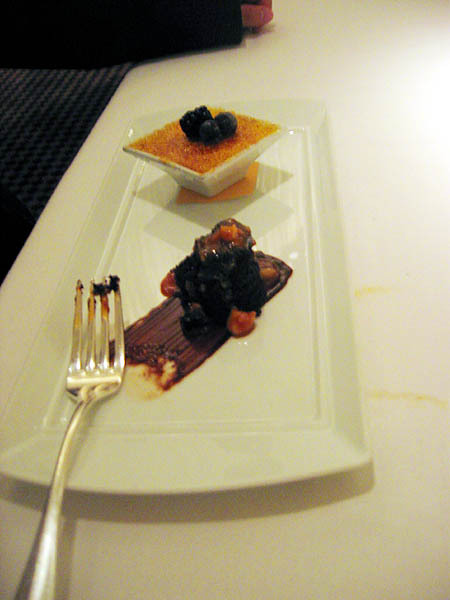 Originally I was planning to have Chef Gand's 5-course dessert tasting in addition to our normal meal. However we dined far too late into the night and Gale had already left by the time we finished our dinner. This abbreviated tasting would have to suffice. I had a vanilla-chocolate cake (think ice cream cake) and a bread pudding with ice cream and apple (the pudding itself was a bit pedestrian). On the other plate was a crème brûlée (very good) and a German chocolate cake (reminiscent of the chocolate cake from Claim Jumper interestingly enough). 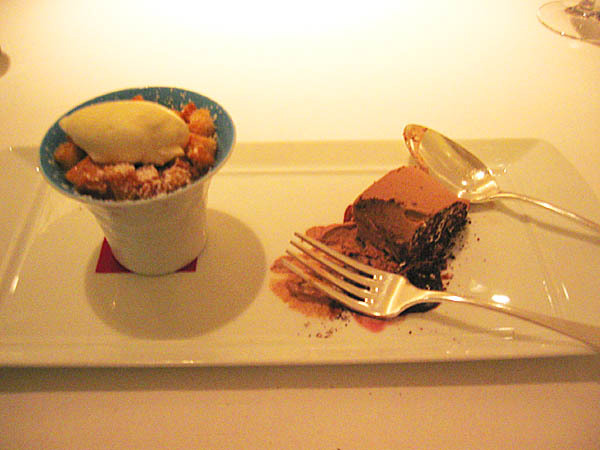 The wine pairing was the venerable Tokaji, one of my favorite dessert wines. However, the choice was a bit obvious and I would've preferred a more unexpected choice, such as a California late harvest or a Moscato. 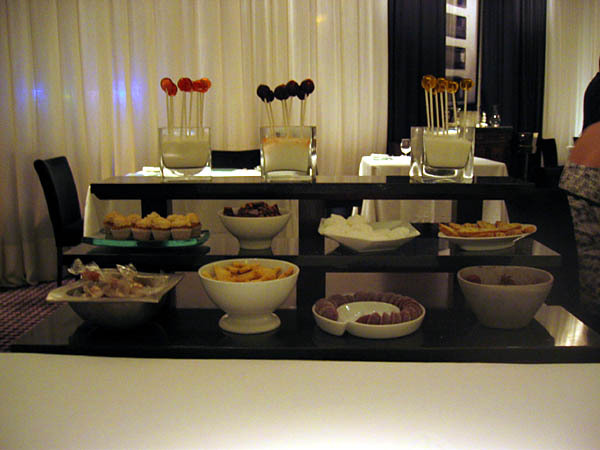 Finally, we were presented with the mignardises and lollipop cart (my first experience with such a thing). From this cart I had a vanilla bean marshmallow, a chocolate truffle, and a serving of biscotti. 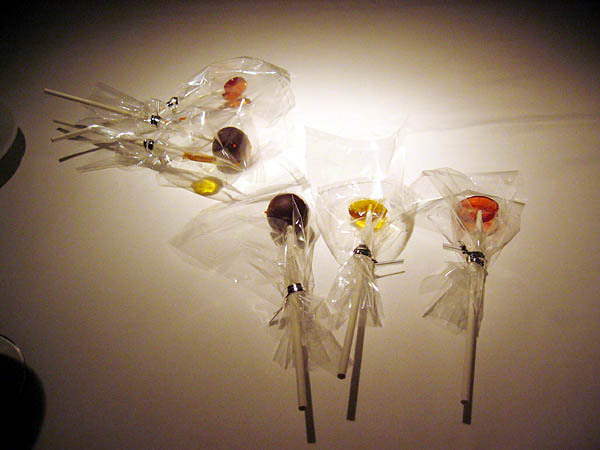 I also requested lollipops to go, which were wrapped and presented nicely. Afterwards, we were also shown a chocolate plate (which I did not get a photo of unfortunately), from which I had a mojito chocolate (overly minty and didn't really taste like the mojito I had earlier that day) and a pink peppercorn chocolate (intense, just like the real thing, brilliant!). 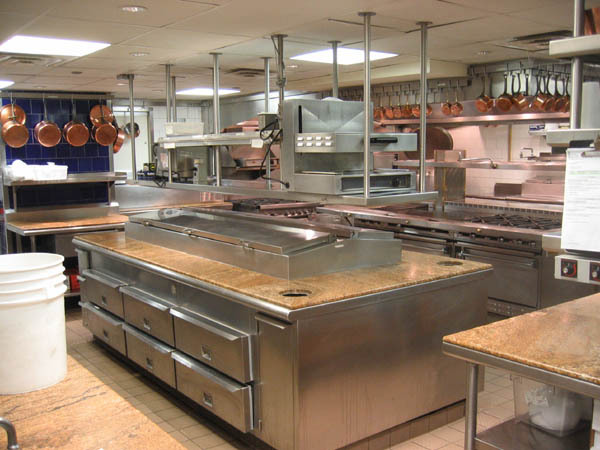 After the meal, we were given a tour of the kitchen area. 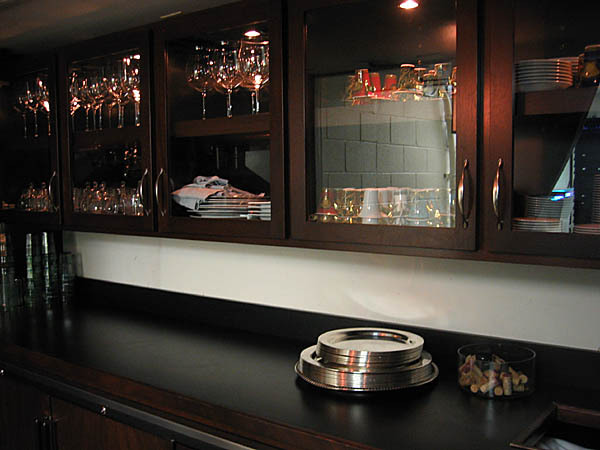 In the first photo, we can see where the restaurant keeps their most valuable drinkware. Those small colorful cups are by Versace, and the large Bordeaux glasses to their left are handblown Riedel Sommeliers (about $70 per stem, and arguably the best in the world). I imagine those were reserved for the parties that order up the $8000 magnums of Pétrus; us mere mortals were served using Riedel Vinums. The second photo is the main kitchen area. 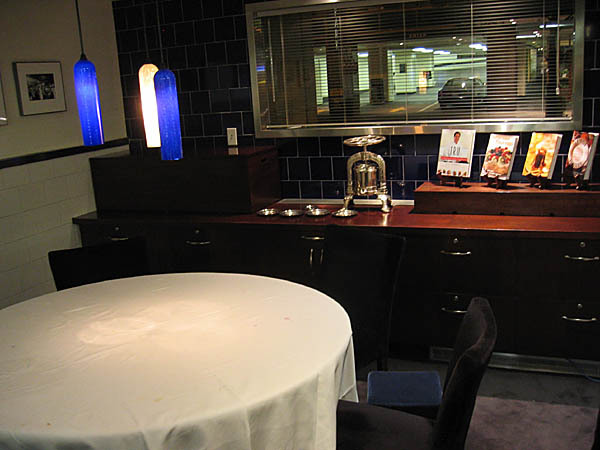 Here we have the Chef's table ($150 per person), located immediately adjacent to the kitchen. 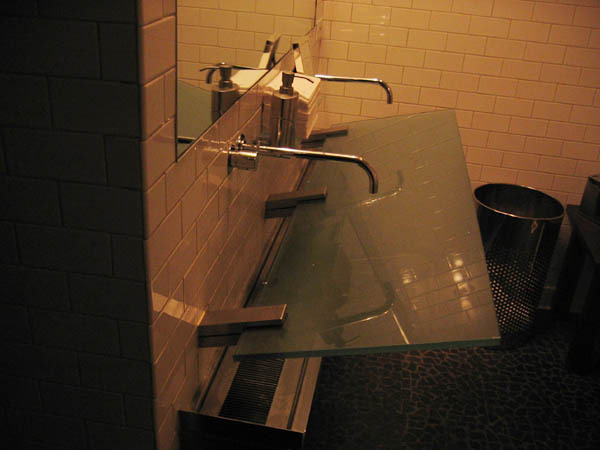 The bathroom was rather plain except for the sink, which I can say without reservation is the most impressive sink I've ever seen; water flows onto a glass plate and then is collected by a trough, pure genius! A fine dining newbie, my companion summarized TRU as "definitely not worth it but I definitely do not regret it." I can certainly understand how it may be difficult to justify spending hundreds on dollars on a single meal. 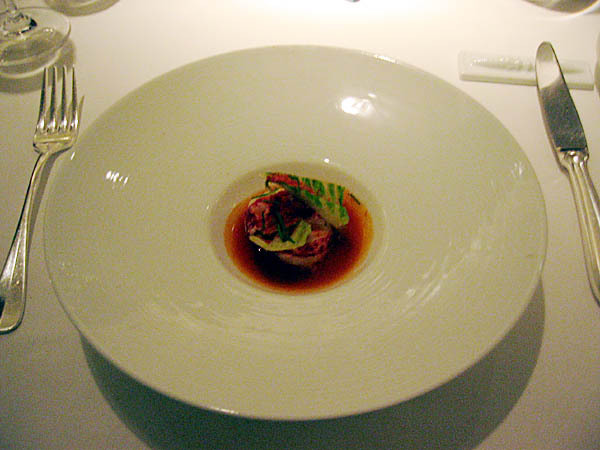 But we must remember that dining at a restaurant of this caliber is not only a mere meal, it is an experience. And one is not presented with merely food, one is presented with edible art. To use a very Donald Trump-ish phrase, it is the total dining experience. With that, I can say without reservation that TRU is probably the "classiest" restaurant I've had the pleasure of dining at. As I've mentioned above, the service here was just a cut above anywhere else. The food was, obviously, not as cutting-edge as what I consumed at Alinea, but almost every dish had a unique strength, something that stood out, something that I would look forward to having again. In fact several items were very near the best I've ever had. 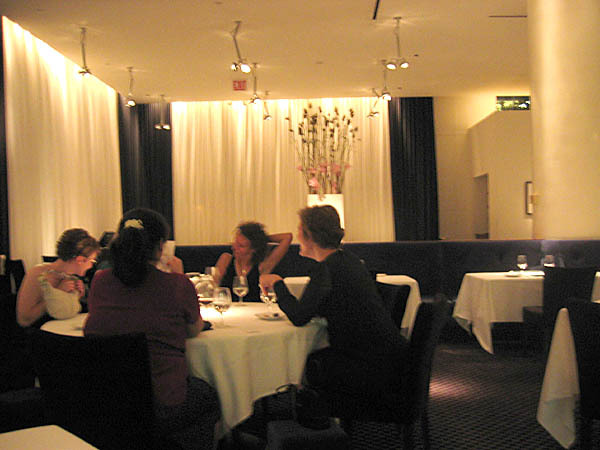 It is no wonder then that TRU has been among the very top restaurants in Chicago for seven years running. My hats off to you, Rick; now just send me my menu. You should be having a table for all family members when you are willing to attend the event like this one. I was really interested to do the same thing for an upcoming function. This is really outstanding to see that you have prepared such a quality blog with such quality content. I appreciate you and thank you for sharing.